1-Say no to diet. Stay away from diet soda, or anything else carbonated. Anything with bubbles will fill up your tummy with gas and bloat it out. Bubble guts is a real thing and it's not pretty, pass on the diet foods, diet sodas and bubbly beverages. 2-Don't chew: No i don't mean your food, keep doing that, I mean gum. Don't chew gum the day you are looking to have an extra toned tummy. Sure, it'll keep your mouth busy and cut down on food cravings, but it'll also fill your tummy with air. 3-Skip the salt. When you eat sodium, you temporarily retain more fluid, giving you a puffy, swollen appearance, and adding extra water weight to your frame. Avoid salt itself, along with processed foods and salt-based seasonings. If you must have salt make sure its unrefined sea salt or Himalayan salt; this kind of salt actually contains over 80 trace minerals, including potassium which can balance water retention throughout your body. 4-Ciao to Carbs. Stay away from heavily processed carbs, like bagels and pasta. Carbs aren't bad for you at all, they are actually quite necessary for thyroid health and energy levels, but when you decrease the carbs in your diet, you temporarily train your body to access and use stored carbohydrates in the form of glycogen, while also eliminating excess fluid you may be retaining.The word carbohydrate has the word HYDRATE in it, meaning for every gram of carbs your body stores, your body also stores roughly 2.4 grams of water. So when you carb deplete, or go super low carb, essentially you are also water depleting. 5-Don't fear fruit. Choose your fruits wisely: Berries, grapes, and citrus contain a near-equal ratio of the sugars fructose and glucose, making them easier to digest. 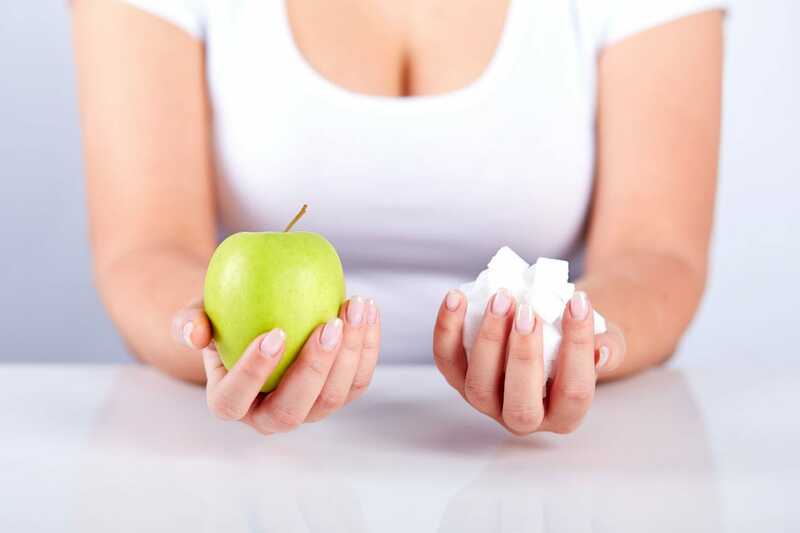 Avoid high fructose fruits like honeydew, apples, and pears. 6-Skip Sugar Substitutes: Avoid food products containing sugar alcohols, which go by the names xylitol or maltitol on the ingredient list, that causes gas and bloating. These sugar alcohols most often appear in processed foods, low-calorie condiments, diet sodas and even flavored supplements. Bonus Points: The day of the big night, make sure you get in a good sweaty cardio session to not only shed any access water weight, but by increasing your heart rate and breathing, you stimulate the natural contractions of the intestinal muscles, helping to prevent constipation and gas buildup by speeding up digestion.